What a weird February we’re having. Last week we received nearly 2 feet of snow and this week we’re hitting 60 degrees! Since snowboarding is out, I’m going to build our first solar kiln. 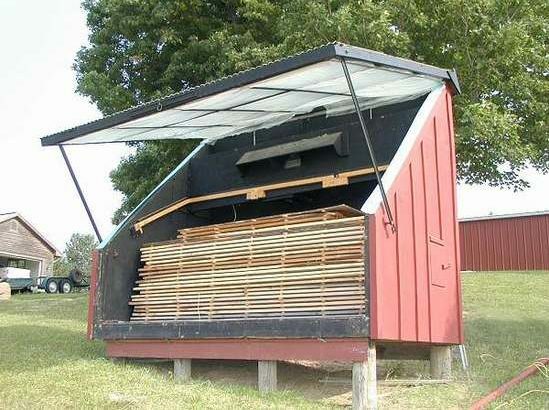 A solar kiln is basically a green house that speeds the drying process after wood has been turned into lumber or firewood. Freshly cut wood has too much moisture to be used reliably in building or burning. In Vermont, the drying process is looooong. Without assistance firewood needs 1 to 2 years of sitting outside while lumber needs up to 4 years depending on the species. And even with that much time there still isn’t a guarantee the moisture content is going to be low enough. To make matters even worse, outdoor drying gets a moisture level into the teens (11% moisture is about the lowest) while wood for making indoor furniture really needs to be in the 6% territory. That means wood needs to dry in the house for a few weeks to months before it is ready to be worked. So, I’m going to build a solar kiln that will live next to our firewood door by the house. Because it will be for firewood it doesn’t have to be as functional as one for drying lumber. This will be good practice! 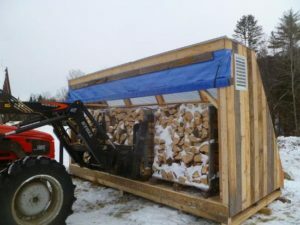 A much larger firewood solar kiln. This is just an example. I’m sure I’ll need to make another run or four to Home Depot, but I think this is a good start. Because this will be next to the house, I’m going to have to spend a hefty chunk on cedar trim. The current plan is to match the trim and paint to the house. That project is going to require framing just like a house because temperature control is crucial. The insulation will be the biggest component of maintaining heat, but the fans are necessary to spread the air as evenly as possible throughout the box. If heat is uneven then the moisture in the lumber will not be even and that’s a huge problem.